If your vehicle did not come with heated seats, here are several Seat Heater kits made of different materials and may be used for Auto as well as Motorcycles, ATV's, Snow mobile or anything else that has a 12 volt source. 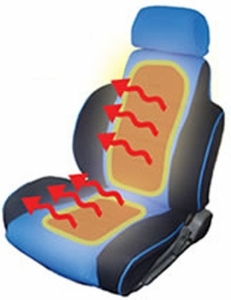 Carbon Fiber Seat Heater Kits use Carbon Fiber thread instead of copper wires which tend to get thin and eventually break after continuous on/off cycles. These kits are vehicle seat specific and are pre-cut to fit exactly in your seat.